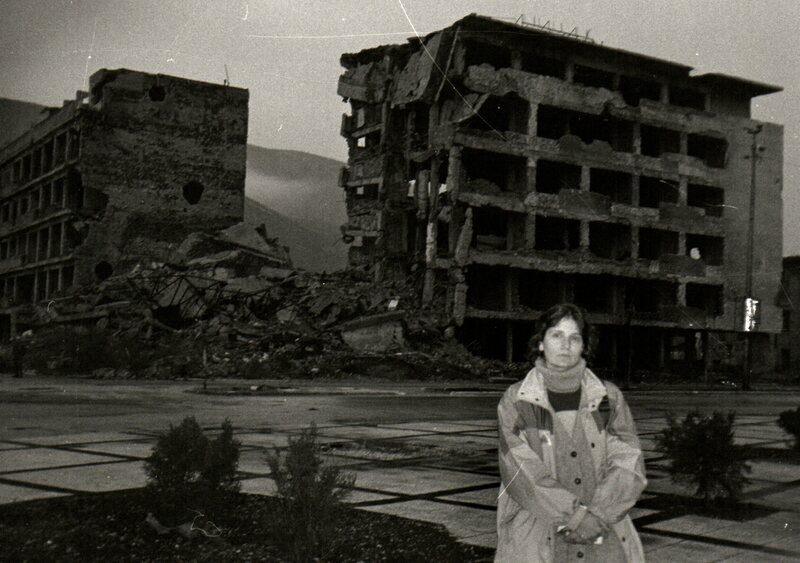 Here Am I during the Balkans War in Mostar in front of a destroyed building after a bombing by the Serbian forces. What can I add? it’s all said by the image behind me. I was there as a journalist reporting about the war and the work of the Spanish blue helmets deployed in the area. The besieged city was a pile of ruins. The public parks had been turned in cemeteries. People was suffering a lot . I remember that the Spanish defence Minister came to visit the troops and took a walk through the streets. There were some kids without coats running around, right next to a park full of graves. The minister called them to give them some candies, and this way, have a photo-op with them. Pathetic. Some bystanders were warning to the kids: “don’t take the candies. He only wants the picture”. But the kids didn’t listen. Of course, the photo reporters were busy with other images of the destroyed city but the minister’s PR staff was working hard. I was In Bosnia those days, so I didn’t see it, but they told me that a newspaper close to the Government in Spain published the picture of the minister and the kids. I’m sorry I brought this horrible picture, but it was the first one I found in which I appear. All my pictures are terrible. I have to find the box of my childhood pictures in search for something nice. I remember when it all happened and I find it good that you are showing this picture. We are very snug and comfortable in our countries and what you said about parks being turned into cemeteries where the children were playing shows how war can destroy everything. And the way the photos can be changed for publicity purposes …. The photo is very impressive. The picture may be horrible, but history is what it is, and we shouldn’t try to hide from it. Thank for your contribution. You’re welcome. It’s true. We can’t hide history and I can’t forget my vivid memories. The sentence about parks being turned into cemeteries is a haunting vision, and one that the media would rather not focus on, instead training their cameras to a PM handing candies to children. The latter is what the world sees, not images like this. Thank you for sharing this. It’s something we should never forget, how war changes everything – and everyone. What a great way to be a part of history. The job, of course, has its ugly side. That is the way of history. I’ve simply tried to be an accurate chronicler of the facts I‘ve witnessed. But you’re right. It was a privilege to be able to do it.